Playwith Interactive to publish N.DOLPHIN’s new MMORPG, Eclipse War Online. 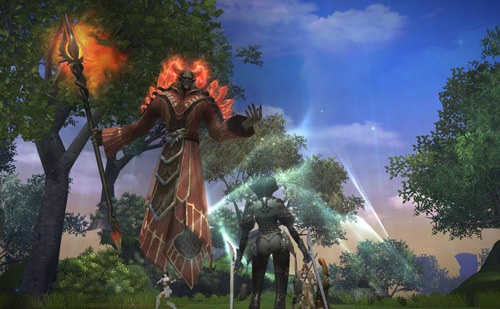 Playwith Interactive has announced Eclipse War Online, a new fantasy MMORPG featuring a monster transformation system. • Transform, Evolve, and Destroy! One main feature introduced by Eclipse War is the Transformation system. Think about what it would be like if YOU were able to play as every mob in a vast fantasy world that spans 3 land masses, is populated by a total of 7 races, and teeming with different species of animal and unknown monsters. Eclipse War is that experience! Any monster or boss has the potential to drop a Transformation Card that will allow you to take the physical form of that creature and assume control of their unique skillset in addition to your base character class skills! No need for mindless grind, get rewarded for your hunting and assume your most powerful form! • Your lands, Your prey, Your time of day! Explore the wide range of different geographic locations in Karis! All transformations have a certain combat advantage or disadvantage based on their target species! Learn what transformation to use based on your foes. Additionally, all transformations have a certain activity or habitat where they will receive special bonuses that can affect combat, crafting, or even stealth. The night-day cycle in Eclipse War also introduces new mechanics. Each transformation will favor the dark of night, or the warmth of day. Depending on what your species is attuned to, receive different bonuses during your preferred time of day. • Freedom to PvP how you want! Eclipse War Online brings different elements of PvP together into one fierce war between two races. Choose to ambush and sabotage the enemy in open world combat. Or head into the battle arena for organized team matches. Eclipse War even offers an exciting new 3 Lane AOS type PvP mode complete with towers and minions! Temporarily steal enemy skills after you have defeated them, similar to the transformation system! Aside from content available for the upcoming Beta, players can be excited knowing that even more content such as Castle Sieges will be released during commercial service! Eclipse War Online was originally announced at G-Star in 2012. The game is being developed by N.DOLPHIN SOFT for PC and is slated to launch later this year. You can learn more and sign up for an upcoming beta test on the game’s teaser site.